1. Heat oven to 400°F. In a 9x9-inch baking dish, stir together quinoa, chicken broth, garlic salt (or garlic), pepper and shredded mozzarella. 2. Top with tomatoes and mozzarella balls. Drizzle with olive oil. 3. Bake at 400°F for 45 minutes. 4. Top with fresh chopped basil. Serve warm. To cook quinoa: add 2 cups of uncooked quinoa to a pot full of 2 cups broth. Cover and cook at a simmer until most of the liquid has been absorbed, about 15-20 minutes. Remove and cool. Fluff with a fork. To make this vegetarian: use vegetable broth of choice in place of chicken broth in this recipe. If there is one flavour combo that encapsulates summer, it’s Caprese salad. 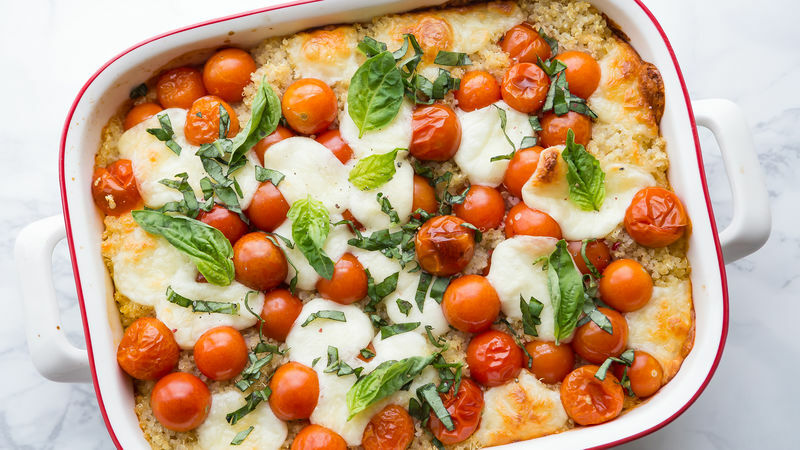 And while a plate full of fresh mozzarella, basil and tomatoes is always a delicious option, here’s one more: a Caprese-inspired bake, with quinoa mixed in for added plant-based protein. Consider it the healthified summer version of a cozy pasta bake. A delicious one-dish dinner, or perfect side dish for potlucks, this recipe pairs beautifully with everything from grilled chicken to a crusty loaf of French bread, served with olive oil for dipping. Try tossing in leftover rotisserie chicken before baking for a heartier meal. Or stir in fresh grilled corn for extra seasonal flavour.